Today is the very last Project Pastry Queen challenge. Over 2 years ago, Ashley and I met up in Austin to attend a cooking demo with The Pastry Queen, Rebecca Rather. I’d forgotten about several great recipes in the book and decided that I’d cook and bake all the way through the book. 100-ish recipes later, it is my most used, most stained, and most beloved cookbook. It’s an intensely rich, dense, flourless chocolate cake that’s topped with a semisweet chocolate mousse, and then coated in a chocolate glaze. The Pastry Queen calls it The American Beauty Cake. My husband calls it The PMS Cake. 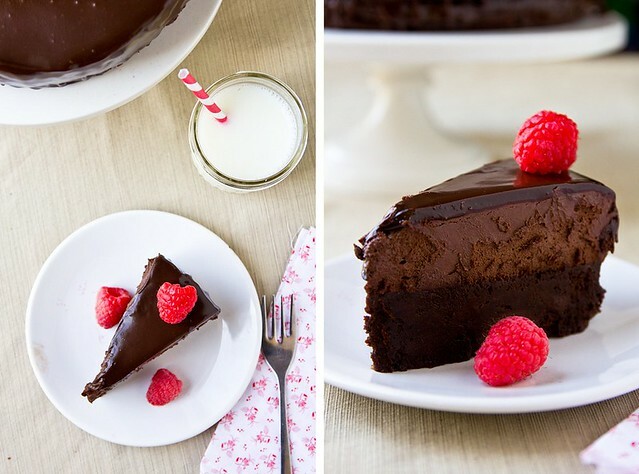 It’s similar to the Chocolate Overdose Cake but has one less component. And it’s one of those recipes that require you to read all the way through first because there’s an overnight step. One I missed last night but welcomed the “quiet time” in the kitchen this morning for a little baking therapy. The cake is meant to be served from the freezer, so if – like me – you were born with a negative amount of will power, there’s still hope. I cut the cake into wedges, placed it on a plastic wrap-lined baking sheet, and froze the slices solid (~2 hours) before individually wrapping them in more plastic wrap. Check out the other PPQ members’ take on American Beauty Cake. Thanks to all those who’ve baked and followed along with the project over the last couple of years. It has been fun. 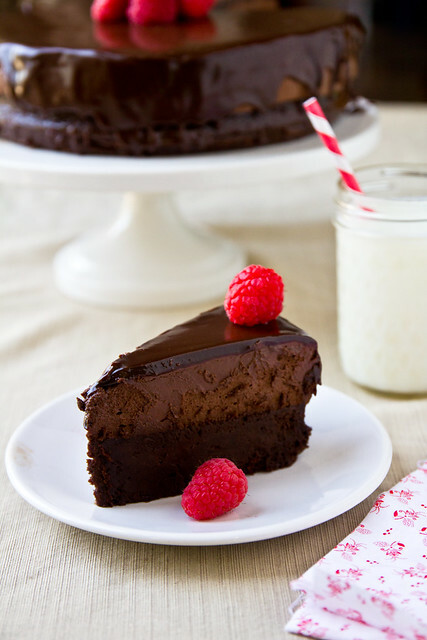 An intensely rich flourless chocolate cake, topped with mousse and a chocolate glaze. Make the cake:Preheat oven to 350. Line the bottom of a 9-inch sprinform pan (outside wrapped with a triple layer of foil to protect from leaks in the waterbath) with a parchment round and lightly spray the bottom/sides with baking spray. Melt the butter and chocolate in the microwave in a large bowl, on 30-second intervals until melted. Whisk in the eggs and sugar until well combined. Stir in the vanilla and liqueur and then pour the batter into the prepared pan. Place the pan in a larger pan (like a 13x9) and fill the larger pan with enough hot water to come up level with the batter. Bake 35-40 minutes, until firm to the touch, and then remove from the oven (but let cool completely in the waterbath). After the cake cooled, I cut ~4-inch wide strips of parchment and lined the sides of the springform pan, pushing the parchment down between the cake and sides (shrinkage made this possible). This helped with removal later. Make the mousse:Melt butter and chocolate in the microwave, stirring until smooth; set aside to cool. Whisk the yolks, sugar, and vanilla together until smooth and then whisk in the chocolate mixture. Using a mixer, whisk the whites until stiff peaks form. Fold the egg whites in 3 batches into the chocolate. Once an addition is almost completely incorporated, add the next. The texture will look completely questionable but keep going. It gets better. Place the cream into the mixer bowl and whip that just until soft peaks start to form. Fold the whipped cream into the mousse mixture until the texture is uniform - you'll fold this much, much more than a more traditional mousse. 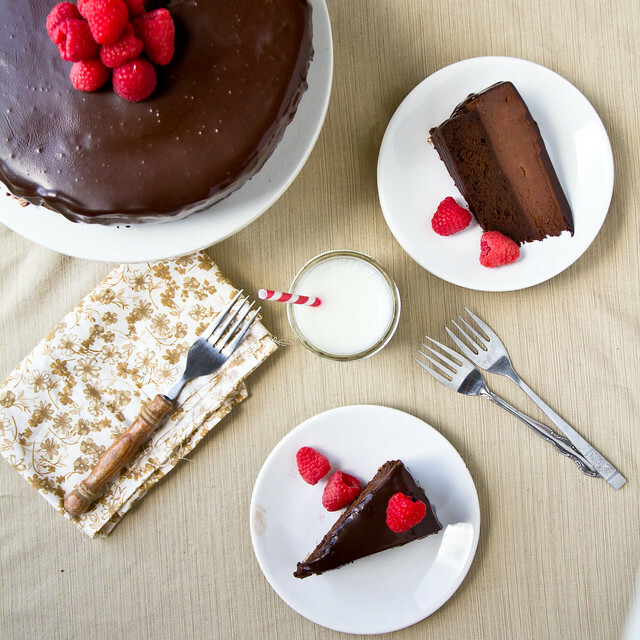 Spread the mousse over the cooled cake, wrap the top with foil, and freeze overnight (at least 6 hours). Make the glaze:In a small sauce pan, bring corn syrup and cream just to a boil. Turn off the heat and add the vanilla and chocolate. Whisk until smooth and then let sit in the pan for 30 minutes to cool and thicken. Remove the cake from the freezer and turn it out onto a rack set on a baking sheet or on a cake plate, mousse-side on top - remove the ring and peel off the parchment sides. Pour the glaze into the center of the cake, letting it flood the top and run down the edges (it won't cover the sides completely). I put the cake in the fridge to set the glaze and then cut pieces for the freezer. To freeze the whole cake, chill the cake to set the glaze and then wrap with plastic wrap and freeze. The cake is recommended as best-served just minutes out of the freezer. wow. Seriously, that’s all I can say. WOW. This looks incredible!! That is one amazing cake! Great photos! 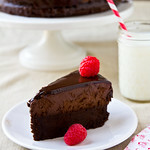 I wish I had a slice of this right now! Chocolate heaven. Congratulations on seeing your goal all the way through. Each and every dessert has been beautiful. This cake, however, epic. Seriously. Epic amounts of chocolate. I can’t wait to see your plans for part deux! Oh my gosh I want this cake! Such a scrumptious recipe! hi there heaven-in-cake-form. You are so lovely. That cake looks unreal! Congrats on the completion of PPQ Part 1! I can’t wait to hear about what is coming up next. oh my goodness that is beauty! I love that you individually wrapped it. What a great idea. It’s a very tempting cake! I’m sending mine off to my parents today so I don’t devour it all! Your American Beauty looks more like something you’d find in a Parisian patisserie! Yet your recipe makes it seem “do-able.” Many thanks! I am going to attempt to make this tomorrow. I noticed that the recipe in the book has milk chocolate listed in the ingredients (for the mousse) and you have used bittersweet. Would it be too sweet with the milk chocolate? I don’t usually have milk chocolate on hand but always keep plenty of semi/bittersweet around. I don’t think it would be too sweet – but using the darker chocolate definitely made for a much richer, more intense dessert. Ok-thanks! I will use the semi-sweet. If it comes out looking half as good as yours I’ll be happy! An amazing cake… that’s all I can say! I’ve bookmarked it and definitely will give it a try! I’ve just found out your blog, congrats for the beautiful recipes and photography! This is an amazing dessert!! Thank you so much for posting!! I just made it last night, but unfortunately could not get a taste of it since I made it for a friend. BUT I am intent on making another Soon to indulge in!! It was simple to make and easy to assemble. Thanks again!! I finally had an excuse to make this! And oh my goodness, it was divine. I do prefer my mousse soft, so I served it from the fridge instead and it was melt in your mouth deliciousness. I froze it putting it together (I also pulled the cake out of it’s pan and popped it on top of the mousse in a second pan lined with cling wrap) and sauced it while frozen, but let it come to fridge temp for enjoying. I made a half recipe that fit my 6 inch springform just about perfectly. I just foundyour blog via pinterest. I tried to make this last night and was soo excited and then I messed up the mousse!it wasn’t thick enough, but I know what I did wrong. Still looks delicious. I will just have to make it again! Thanks for the recipe! I am planning on making this for a gathering tomorrow. I plan to freeze it overnight but is it okay to move it to the fridge tomorrow and serve it fridge temperature? Please let me know! I cannot believe how insanely delicious this looks — and GLUTEN free!!!! Yes, it will be fine served that way. My sister made this cake for my grandma’s birthday tonight. It was incredible, super fudgy & sweet and I’m told it was really easy to make. If you are cheese cake lover, this cake is definitely for you, it has that moist dense consistency to it, so yummy! this will for sure be my goto recipe for gluten free cake!!! This is gluten-free, right? It looks AMAZING! Wonderful job! (Great photos too). I dont care for the flavors of any kind of alcohol. If I didn’t want to use rum or liqueur do I need to substitute something for it or just leave it out? It looks amazing thanks for the recipe!!!!!! It’s not a lot of liquid but I’d still sub with something like milk for the alcohol. I used two tbs coffee instead because I didn’t have any rum, it’s in the 6 hour freeze period now so I haven’t tasted it yet but I’m sure it will be good!! Try very strong coffee. That intensifies the flavor of the chocolate. i made this cake yesterdayy and it was so goooooodddd . i definitly recomend it . i used lindt dark chocolate for all the recipe and it turned out so good . the best cake i ve ever had and the whole family loved it. You can generally reduce sugar by up wards of 25-33% in most baked goods without having a noticeable effect on texture. I don’t recall doing it with this one, but I’d have no reservations about using only 3/4 cup of sugar. This cake looks fantastic, but I no longer use raw eggs for anything. Hope I can find a mousse that is cooked to put on top of the cake. This cake tastes as fabulous as it looks! My daughter found the recipe and it became my challenge to make it. The instructions are perfect! I can only take credit for following them to the letter. This was the perfect cake for a chocoholic’s birthday! Perfectly delicious for Passover – thanks from everyone at the table! I garnished with an artistic drizzle of white chocolate over the ganache. It looked so dramatic! Thanks so much for a delicious recipe perfect for a fancy party. Hi! Eek! I tried to make this last night, and I think my water bath must have leaked – I did triple wrap the pan in foil, but for some reason, when I went to take the cake out, there was a liquid layer over the cake, and I’m pretty sure it was water… So, I’m going to try this again tonight, but do you think it would turn out too rubbery/otherwise bad if I didnt use a water bath? Thanks! I followed the cake recipe exactly, but the cake is not firming up at all. The butter appears to have separated and is sitting in a pool on top. It is definitely not water from the water bath. Any idea what I might have done wrong? I’m going to let it bake a while longer to see if it does firm up, but it’s already been in the oven for 50 minutes. I’m so disappointed in myself. I really wanted this cake. Made this cake for a birthday party and it was AMAZING!! Everyone loved it! It was easy and the directions were on spot. Thanks for an excellent recipe. I made this cake for my boyfriend’s birthday party last night. It was a wonderful crowd-pleaser; everyone loved it! I’m not a great baker but was able to follow the recipe and it came out of the pan looking great. I chose to not go with the chocolate glaze but decorated the top with whipped cream flower shapes and chocolate shavings. For the cake, can I use sweet wine instead of dark rum? For the glaze, can I use instead of light corn syrup? Yes on the sweet wine. Not sure what you’re asking to sub for the corn syrup. I made this for Thanksgiving when I had just found out that my sister is gluten intolerant. This cake is absolutely AMAZING! No one misses flour when they eat it. The only thing I changed was that I put in 2 tbsp espresso instead of rum, and it just made the cake so rich and decadent. I’m in the process of making it for Christmas, and my family full of chocoholics can’t wait to enjoy it again! Hi there! This looks amazing; I plan on making it tonight for my step dads birthday tomorrow. Just a question – I don’t have a springform pan, would this still work with a regular 9 inch pan? Thanks! I made this cake last night using my new Pastry Queen book. I had lots of trouble. The recipe says to use a 9 inch cake pan and there was no room for the mousse. I melted the expensive Godiva milk chocolate bars and butter, then before I could blink it went from melted to the consistency of fudge. I almost threw it out because I could not imagine it would combine well with egg whites but it finally did I grabbed a spring firm pan and flipped the cake into it, then there was plenty of room for the mousse. But the cake sort if fell apart. It is in the freezer but I could not imagine eating a frozen cake so decided to google to see if this was a misprint in the book. I am so glad I found this blog! Maybe in her book she calls a springform pan a cake pan. I guess I will leave it in the freezer until after Thanksgiving dinner. If there is any left, do I keep refreezing? Her book says to melt all this chocolate in a metal bowel over simmering water — I am so glad to see microwave is fine. I will print your recipe because it has a lot of helpful hints that are not in the book She calls for 26 ounces of premium quality chocolate – this is an expensive recipe to mess up. I’ve tried to make this cake several times now, but the water bath leaks into the cake every time. What am I doing wrong? I wrapped with foil as instructed. what’s the longest you can leave the cake in the freezer, i.e. how far in advance can you make it? thanks. Made this cake on the weekend April 2016 and by far the best chocolate mousse cake. We went to a fancy restaurant the night before eating it and my husband ordered a flourless chocolate torte and I wasn’t happy he was going to eat it made by a professional chef the night before he is to get his birthday cake….this cake was better than the restaurants!! My only tip wait 20-25 before eating…a little hard after attempting to eat it right out of the freezer but didn’t change how absolutely delicious this cake is. Thank you thank you and my husband thanks you!! !